Barcelona: Barcelona hope record signing Ousmane Dembele could be back in action in three and a half months after successful surgery on a torn hamstring in Helsinki on Tuesday. "Dembele was successfully operated on Tuesday to repair a ruptured biceps femoris in his left leg," Barcelona said in a statement. "He is expected to be out for three and a half months." The Catalan giants feared their record €105 million signing could be sidelined for four months after suffering the injury attempting a backheel in Saturday's 2-1 win at Getafe. 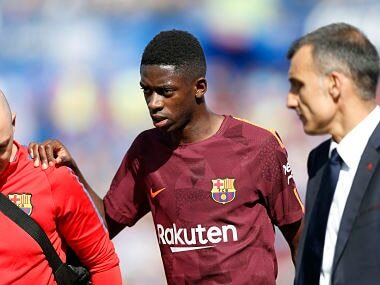 It is the first major injury of Dembele's career and Barcelona boss Ernesto Valverde admitted a more experienced player may have picked up on signs all wasn't well before completely tearing the muscle. "He doesn't have experience of recognising small niggles or more explosive moves that can mitigate these type of things," Valverde said on Monday. "A backheel is the most aggressive move for the hamstring. Possibly a more experienced player wouldn't have done it." The 20-year-old may have paid a heavy price for missing most of his pre-season preparation as he went on strike from training at Borussia Dortmund to try and force through his dream move to the Camp Nou. He will be sidelined for the rest of Barcelona's Champions League group campaign and faces a race against time to take part in the first Clasico of the season against Real Madrid on 23 December.